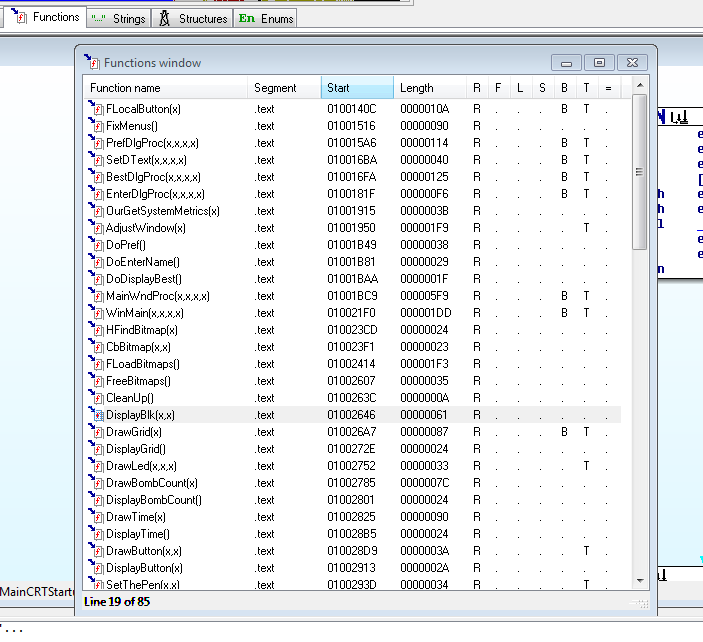 DLL injection provides a platform for manipulating the execution of a running process. It&apos;s very commonly used for logging information while reverse engineering. For example, you can hook the IAT entry for a given imported operating system library function, and then log the function arguments onto disk. This provides you a data source that can assist in rapidly reverse engineering the target. DLL injection is not limited to logging, though. Given the fact that you have free reign to execute whatever code that you want within the process&apos; address space, you can modify the program in any way that you choose. This technique is frequently used within the game hacking world to code bots. Anything that you could do with byte patching, you can do with DLL injection. Except DLL injection will probably be easier and faster, because you get to code your patches in C instead of assembly language and do not have to labor over making manual modifications to the binary and its PE structure, finding code caves, etc. DLL injection almost entirely eliminates the need for using assembly language while making modifications to a binary; the only assembly language needed will be small pieces of code nearby the entrance and exit to a particular hook to save and restore the values of registers / the flags. It also makes binary modification fast and simple, and does not alter any cryptographic signatures of the executable that you are patching. 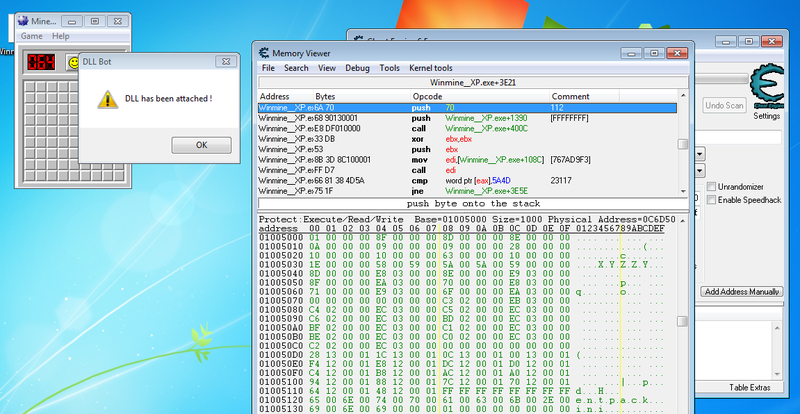 DLL injection can be employed to solve highly non-trivial reverse engineering problems. The following example is necessarily vague in some respects because of non-disclosure agreements. We use OpenProcess() with RWX (Read Write Execute) permissions to get handle to target process. We use WriteProcessMemory() to write out DLL into allocated space. This is the final process . Create a remote thread in the target process with CreateRemoteThread() using the address of the beginning of the DLL as the entry point to execute injected code. Writing step by step on all these step would make this article too lengthy So , I am going to link some excellent write-up on how to perform injection in detail. 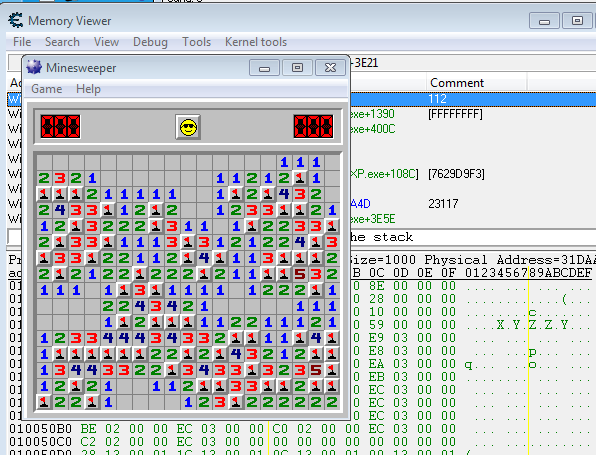 With all the newly gained knowledge , I am going to hack minesweeper by writing a simple bot to automatically play the game. Let’s check if we can do ‘Hello world’ quickly. /* The DLL is being loaded for the first time by a given process. You can study what these functions do by setting up break points on these functions and then play the game to see when they are triggered. I studied one functions called StepSquare(x,x) located at address of 0x1003512 , It takes two parameter and jumps to square provided to it’s argument . This function will be used to step our bot throughout the it’s execution. Now we that we know how to step forward in the game , we need to know where actual bombs are located to avoid stepping on it and complete the game. Let’s start by fixing size of height and width to check where it is located in memory. 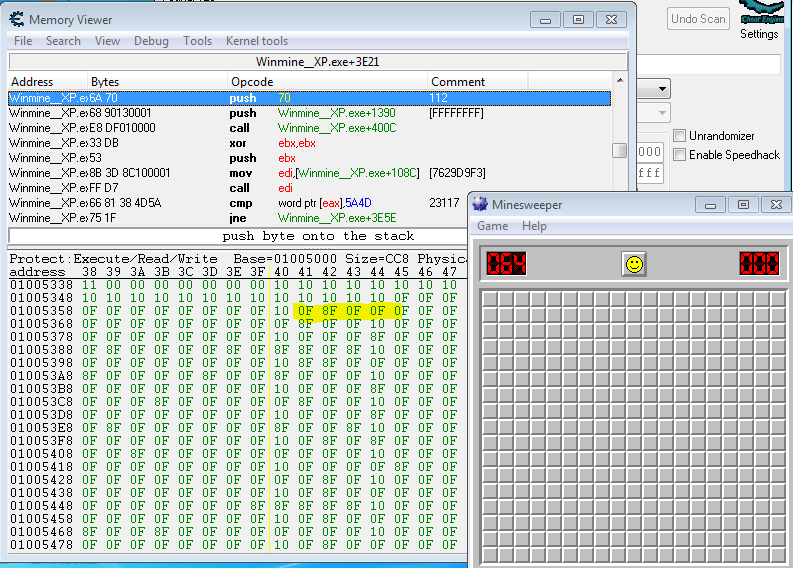 In minesweeper choose some game size say 17x19 from Game > Custom and then open the process in cheat engine. Similarly we can find out width and it was 0x1005334 in my case. Now let’s check out memory at address where width and height are located. After some observation and some trial & error I noticed something near these memory address. 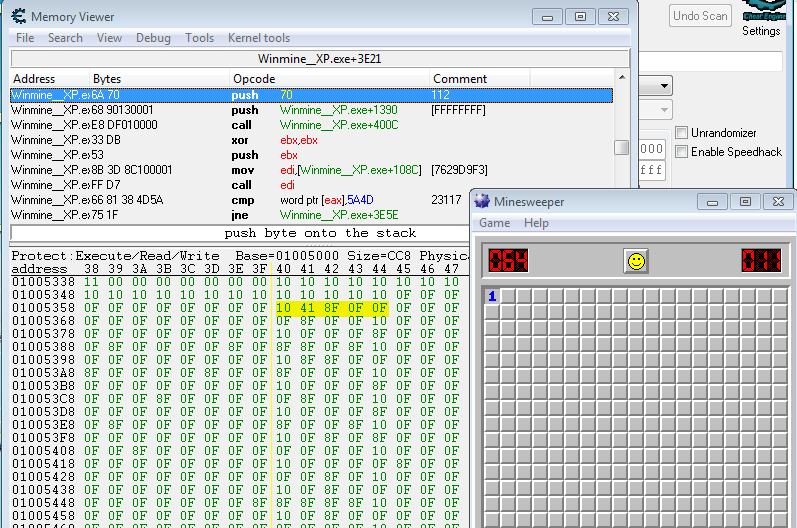 Notice the highlighted memory space. These are the memory located which store if bomb is located a particular tile. 0F means no bomb while 8F means bomb. Coding the bot is simple enough we just need to travel down the tile array and skip tile if it contains the bomb. For travelling we’re gonna use StepSquare(x,x). You can read here in detail on how to call function by its address. You can try making a DLL injector yourself instead of relying on Cheat Engine for it. It’s not too hard and fairly easy to implement. You can try to make hacks for other games , maybe Counter Strike 1.6? Global Offensive ? Only bottleneck with modern games is that they come with cheat protection , so it’s not easy like this to make cheats.